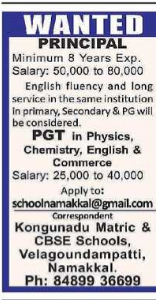 Kongunadu Matric and CBSE Schools, Namakkal has advertised in THE Hindu newspaper for recruitment of Principal, PGT jobs vacancies. Interested and eligible job aspirants are requested to apply immediately.Check out further more details below. About School:The school aims at providing a complete knowledge in all walks of life to its students. We try to be the second parents of our students. We involve ourselves totally in giving a pure and perfect education. The ultimate aim of our school is to sculpt the students into humans and so every activity is designed as fulfilling the thoughts of Mahatmaji. We endeavour with the support of the management and cooperation of the parents in achieving these objectives. (b) Good communication skills & long service in the same institution in primary, secondary PG will be considered.